This is a Leap — a popular science article on quantum research written by scientists and reviewed by teenagers — published in Quantum Views. I am sitting at my computer and writing an article. When I finish and decide to publish it, a chain of events will start. First, my computer will take the electric signals encoding the words I wrote and turn them into microwaves. They will travel through air to my router and then via a cable further into the world. At some point, they will be converted into light that will travel through optical fibres to the other side of the world. Here the whole process will be reversed. Light will be converted back to microwaves which will arrive at your computer. It will turn them back into electrical signals that will tell your screen what words to show you. This intricate process is possible thanks to the various ways of encoding information. Computers shuffle electrons around; that is how they process and store information. Microwaves can pass through walls so they are good for communicating between a computer and a router. And light travels fast and unperturbed across thousands of kilometres so we use it for sending information around the world. For quantum computers, the situation will be no different. We will use one system to build a quantum computer and another to send quantum information to other quantum computers through a quantum internet. Classical computers work with information encoded in bits; each bit has the value zero or one. In a quantum computer, each quantum bit (or qubit for short) can be both zero and one at the same time. A quantum computer can, therefore, calculate certain things faster. This can help us to solve difficult problems in physics and chemistry, giving us a better understanding of the world around us. And if we can, for example, better understand chemical processes in our bodies, we can develop better medication for life-threatening diseases. So how does one build a quantum computer? The most promising route at the moment uses superconducting circuits. In a way, they resemble our classical computers but are cooled to extremely low temperatures. The electrons can then flow through the superconductor without any resistance, so the quantum information they store can be preserved. If there were resistance, the qubits would decay into classical bits. Having a quantum computer is good; having several even better. The size of a quantum computer is limited (it has to fit into a cryostat to be cooled down) so it cannot have more than a few hundred qubits. This is already enough to perform tasks classical computers cannot do. But there are many problems it cannot tackle alone. If we had many quantum computers and could send qubits between them, we could use their combined power to solve even the most difficult problems. Illustration of the device. The electric field of qubits (shown as black electric circuits) pulls on the mechanical oscillators (yellow strings). The pull is measured using light which propagates between the two systems through an optical fibre (blue). 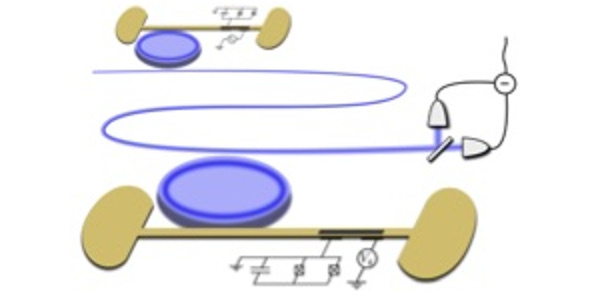 The blue disks—optical resonators—are added to improve the measurement sensitivity. The detector is shown at the right end of the fibre. To send qubits from one quantum computer to another, we have to convert them to light. Unfortunately, we cannot do it directly—photons would get absorbed by the superconductor and heat it up. The circuit would no longer be superconducting and the delicate quantum superposition (the qubits being both zero and one) would be destroyed. Instead, we need a system that can mediate the interaction. A superconducting circuit and light can be connected by a mechanical oscillator—say, a tiny drum or a miniature string. The circuit’s electric field (whose strength specifies the value of the qubit) pushes or pulls on the oscillator. By bouncing light off of the oscillator, we can measure the pull or push and find out the state of the qubit. If the qubit started in a superposition, the measurement will collapse it into one of the possible outcomes—zero or one. Schematic depiction of the measurement. We can imagine the light as an arrow and the measurement as a smaller vector. The qubit value determines the direction in which the small vector points. When the qubits have different values (0 and 1; or 1 and 0), the two situations cannot be resolved and the qubits become entangled. Imagine we now have two such circuits. We prepare each qubit in a superposition (each qubit is a zero and one) and bounce the same beam of light off both of them. The light measures the values the qubits have, but only partially. If both qubits have the same value (both are zero or both are one), the effects add up and we can distinguish the two states. But if the qubits have different values, the two shifts cancel and we cannot tell which value each qubit has. We know one is 0 and the other is 1, but we cannot know which qubit has which value. When two quantum computers share entanglement, they behave like one larger computer. We can use entanglement to send qubits from one computer to the other one, in what is called quantum teleportation. We can also do big, complicated calculations (that none of the computers can do alone) together on both computers. We thus achieved our goal—we can do more with a network of quantum computers than with one computer alone. All in all, quantum computers might bring a revolution like conventional computers did. Fifty years ago, nobody could imagine use of computers other than solving complex scientific problems. And yet, we all carry computers in our pockets today. If quantum computers shall become as ubiquitous, fast and reliable quantum internet must exist. Building it is a challenging task but, as we have seen, an achievable one. This article describes research I did during my PhD at the Leibniz University Hannover, Germany . A freely available version of the paper can be found at arXiv:1512.00768. Classical computers (normal computers, the ones we have at home) use the binary system, so they store encoded information in ​bits. Each of these bits have a value of either 0 or 1. But with quantum computers, the bits (which are called qubits) can be 0 or 1 at the ​same time. This means that quantum computers can solve far more complex problems than classical computers, because while classical computers are busy doing all these calculations one at a time, quantum computers can perform multiple calculations at once, achieving the goal faster. How they physically do this is through the use of superconducting circuits. The electrons flow through these circuits fast and intact thanks to the cool temperature the circuits are kept at. If the quantum computers weren’t so cold, the qubits would turn into normal bits and decay. But the size of a quantum computer is limited, so the most ideal thing to do is have lots of small quantum computers working together at once to solve problems. To send the qubits between computers, you need to convert them to light. But there is only one way you can do that, and it's through the use of an oscillator which would be connected to the superconductor and light. The light bounces of the oscillator, pushing and pulling it. And by measuring the push and pull, we can measure the qubit. This does mean, however, that if you have two of these circuits, and you bounce light of both of them: if the two qubits have the same value, its easy to distinguish which is which. But if the value is different (one is 1 and the other is 0) then you can’t tell which one’s what. When this happens, the qubits become “entangled”. This is good, however, because if you measure one, and say, get a 1, then you immediately know the other qubit has a value of 0. But you can’t choose which qubit to measure, it’s a matter of chance. This only happens with qubits in quantum computers, not normal computers. Entanglement is also good because it connects quantum computers and helps them solve incredibly difficult problems and act as one, unified, big computer. All of these reasons are why the quantum computer would be so much cooler and better than normal ones. Černotík, Ondřej and Hammerer, Klemens, Phys. Rev. A, 94, 1, 012340 (2016), 10.1103/​PhysRevA.94.012340. On Crossref's cited-by service no data on citing works was found (last attempt 2019-04-25 19:24:31). On SAO/NASA ADS no data on citing works was found (last attempt 2019-04-25 19:24:34). This View is published in Quantum Views under the Creative Commons Attribution 4.0 International (CC BY 4.0) license. Copyright remains with the original copyright holders such as the authors or their institutions.